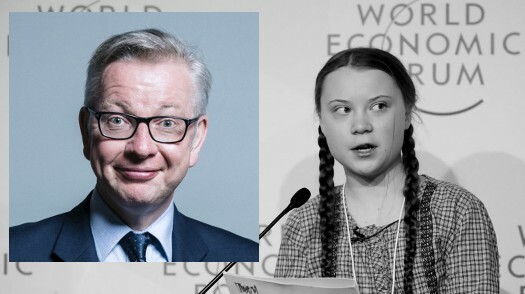 Above, Swedish climate activist Greta Thunberg speaking at the session “Preparing for Climate Disruption” at the World Economic Forum in Davos on 25th January 2019; insert; Gullible Gove. Pictures: World Economic Forum + The Crown (British). Yesterday, those of us with enough ingrained masochism that caused us not to switch off our TVs after listening to the terrible report of the terrorist attack in Sri Lanka over Easter, subjected ourselves to watching a sixteen year old with an articulacy, eloquence and self confidence far beyond her years, lecture us on our sins and iniquities relating to our output of CO2! Present for this group humiliation was Gullible Gove, supposedly a cabinet minister. The word supposedly is used because there is now a question of doubt whether or not the Unfortunate Kingdom of Great Britain and Northern Ireland actually still HAS cabinet government! There is of course, no doubt at all that this child believes absolutely the nonsense that comes out of her teenage mouth. This, with the urgency of youth causes her to be thus motivated to do what she can to prevent “environmental destruction”! Today, on the subject of Brexit, Doctor Richard North in his blog-post today (http://eureferendum.com/blogview.aspx?blogno=87216), describes the great depths of the failure of the British political system. What the attention given to Miss Thunberg demonstrates is that the failure is systemic and across all policy areas. Of course, Miss Thuunberg would have us all panicking about CO2 – which is to use her words (that she applied to fracking and use of coal) “beyond absurd”. As absurd about worrying that the Earth’s gravity will fail and we will all be thrown off the surface and into the far reaches of outer space to our deaths. What this organ would urge you to panic about Dear Reader is the FACT we have a political system that has broken down and our politicians have proved themselves unable to adequately govern the country! Returning to the subject of Miss Thunberg however, I have a great deal of admiration for this teenager. After all she is only 16. At that age it is OK to be gullible and to be misled. Gullible Gove on the other hand is 51 and old enough to know better! Additionally, she suffers from Asperger syndrome (https://www.autism.org.uk/about/what-is/asperger.aspx) so life has already thrown more of a challenge to this child than it has to many more fortunate unafflicted children. It appears that she might be awarded the Nobel Peace Prize. Hence the title of today’s post! You see the award come with a cash gift of SEK 9 million. At 11:30AM today, this was worth £742,275.45p. There is a long established custom and practice that recipients of the prize give away the prodigious sum of money to a good cause – generally the one they are associated with. Now, on the subject of giving away £742,275.45p, your Editor would maintain that this is, if you are such as the Sultan of Brunei, Sir Philip Green, Bill Gates or even President Donald Trump quite an easy thing to do! This is because for such as the aforementioned, £742,275.45p is as President Trump would suggest is “small potatoes”. However, for those of us of average wealth, £742,275.45p is a life changing amount of money! And yet there will be politicians – several who will be in line for full MEP pensions – who will – if Miss Thunberg receives this money will expect and suggest that she should donate it to a relevant good cause. And she probably will. Which will mean that should this teenage girl grow up to be a woman who leaves her celebrity status behind her – and the income opportunities such gives – she will have given away money she could not really afford to give away. Of course this will invoke no sympathy whatsoever from the arrogant, self righteous, pompous politicians that surround her presently! To restate, I admire young Miss Thunberg, but for those politicians surrounding her and egging her on, I have nothing but contempt.